The island of Mata Nui is a bustling place. First the Toa landed, protecting the island's villagers from Rahi, wild beasts controlled by the evil Makuta. Then the Bohrok swarms came, tearing through the land. The Toa defeated their threat and evolved into new forms, the Toa Nuva, in order to combat the Bohrok-Kal, six powerful enemies who stole the Toa's elemental powers. Now a new threat has emerged to face the heroes of Mata Nui and seek out the mysterious seventh Toa. 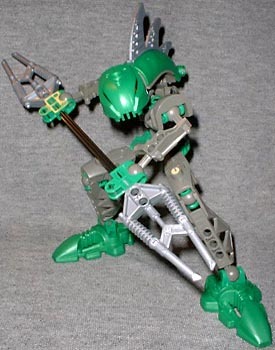 We didn't have a Primer Course for Lego's last Bionicle line, the Bohrok-Kal, because they were identical in design and construction to the previous Bohrok. 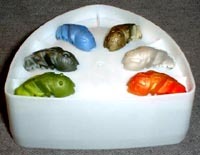 Rather than swarms of the beasties, there were only six, with bits of their bodies molded in the same silvery "protodermic" armor that the Toa Nuva had. They managed to strip the Toa of their powers, but that's more of a plot point and doesn't really have an impact on the toys. The Rahkshi, however, are an entirely different story. Looking for all the world like a giant kung-fu grasshopper, the Rahkshi are the fiercest foes the Toa Nuva have ever encountered. Spawns of uber-villain Makuta, the Rahkshi have mastered the island's elemental powers for evil purpose. Taller and thinner than the semi-spherical Bohrok, the Rahkshi dwarf even the Toa. All the Rahksi share the same body construction and have the same action feature: turn a knob on its back and its shoulders swing side-to-side, attacking with a large double-tipped spear. The Rahkshi are tall enough to strike at the Toa's masks with their spears, so the basic play features that have been part of this line since the beginning are, if you'll pardon the pun, still in play. The only difference between the six kraata are their colors - each is a two-tone blend that complements its Rahkshi nicely. Each kraata goes through six evolutionary stages, making its Rahkshi better than it was before. Better, stronger, faster. Thus, while the rahkshi have the same collectable element that the entire Bionicle line has had so far, you can get by without catching them all. If you do want to collect kraata, you'll find them not in the cardboard boxes that kanohi and krana arrived in, but in small plastic cups. About half the size of a babyfood jar, each cannister has three kraata, with room enough for many more - the lid has indentations for six kraata to latch onto for display. No, there's no digital trickery in that photo: the kraata in the cannisters have unique color sets unrelated to the Rahkshi (yet). Though the original kanohi came packaged with Toa heads, and the krana with Kanohi Nuva, the kraata packs do not contain any superfluous parts. The kraata have the ability to infect the kanohi masks with just a touch - any being that wears an infected mask instantly becomes a thrall of Makuta, so the Rahkshi are a double threat. Kraata have been found on Mata Nui for almost as long as the Matoran villagers, though the Turaga (sort of the high priests/clan leaders of the villages) do their best to capture the kraata and put them safely in stasis. Though kraata do not communicate with other beings, though they can most likely communicate with one another. Very few of the kraata ever reach the seventh stage of development - Shadow Kraata - which is capable of infecting kanohi from a distance. When a kraata is exposed to protodermis, the mysterious substance that became the Toa Nuva's armor, it evolves into a Rahkshi; you can see the similarity between the kraata and the shape of the Rahkshi's head. This armor remains in a state of dormancy until a second kraata crawls inside to basically become the "driver." In the story, the kraata that powers a rahkshi must be of the same type that was originally exposed to the protodermis; a Kraata-Cu evolves into Kurahk, and only becomes active when another Kraata-Cu joins it - no other kraata would be compatible. The Rahkshi's fierce elemental power is part of their being - the large staffs only focus the energy, not create it. In order to defeat these foes, the Toa must remove the kraata from the armor and return the Rahkshi to its dormant state. The kraata is housed under the large, spiny shell on the Rahkshi's back. The ridges on the Rahkshi's backs are all patterened for the individual character: Guurahk has a biological "dorsal fin" look, while Vorahk has auger bits; this gives the toys a bit of variety and personality that color alone cannot convey. If the Toa can get in close enough to strike, they can eject the kraata from the armor by striking at the Rahkshi's head. Hit from above, the head flips down, throws the colored shell back and flings the kraata through the air. If the kraata touches the Toa's kanohi, it can be infected, so there's quite a bit of risk for the heroes. Last year, Lego won a ToY Award for "Best Packaging" - the Bohrok tubes were more than just disposable plastic, instead giving us some additional play value beyond what the toy inside does. 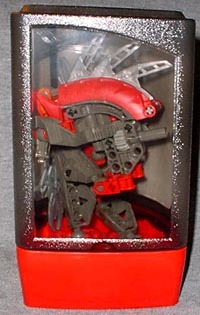 This trend continues with the Rahkshi: rather than a cylinder with a twist-off lid, the Rahkshi come in triangular tubes; the lid is found on the bottom of the cannister, and pops on and off rather than twisting into place; once assembled, the Rahkshi can be stored in a squatting position inside the tube, simulating its wait in stasis for a kraata to join it; peel off the back label from the packaging to reveal the Rahkshi inside. While not as cool as the Bohrok nests, this is still a fairly nice feature. Additionally, the lid can be used to display your kraata - flip it over and there are slots for six kraata to rest along the two curved edges. Lego seems very concerned with making sure that the Bionicle tubes give fans more for their money, and that's a good choice; it's much better than clamshells or plain cardboard boxes. Overall, the Rahkshi are a damn fine addition to the Bionicle mythos. They're major players in this year's direct-to-video Mask of Light movie. Plus, there's even more brick-built goodness on the way to keep the island of Mata Nui and its inhabitants hopping.